The Los Pinos Fire Protection District, its headquarters located in Ignacio, protects an area of approximately 325 square miles with a population of about 8,000. The district operates three stations with a chief, a deputy chief (operations and training), an assistant chief (fleet and facilities maintenance), six career firefighters and 12 volunteer firefighters. The district maintains working mutual aid agreements with its bordering fire departments, the Durango Fire and Rescue Authority and the Upper Pine River Fire Protection District in Bayfield. Resources from all three agencies were deployed at this incident. At 5:48 A.M., the Los Pinos Fire Protection District was dispatched to a report of a structure fire in the area of County Roads 510 and 512. Prior to being notified by dispatch, the on-duty crew at LPFD Station 1 had received a telephone call reporting a large fire in the same area. The initial call was received by the LaPlata County Central Dispatch Center in Durango and information was relayed to the Southern Ute Tribal Police Dispatch in Ignacio. Both Los Pinos Fire and Durango Fire were paged within seconds of each other by their respective dispatch centers. While responding, I had heard initial reports on the Southern Ute Police frequency from the dispatcher and from officers who had arrived on the scene that explosions were occurring and that their vehicles were being hit from shrapnel and bullets going off in the fire. Los Pinos Firefighter Charles Talley had arrived on scene just prior to Los Pinos Engine 1. He reported on our frequency that his personal vehicle was being hit by objects and that he was backing out. My initial thought was, what were they doing parked so close to the fire? initiated. The crew from Engine 1 had backed into the driveway of the residence and was stretching a line for a portable ground monitor to hit the fire in the main structure. I arrived at the scene shortly after Engine 1 and assumed command of the incident. In sizing up the scene, I noted that an approximately 2,600-square-foot two-story residential structure was fully involved. Looking from west to east, I noted a white pickup truck burning, a 350-square-foot outbuilding was well involved, a horse trailer that had fire showing from the interior, and another pickup truck that was parked south of the outbuilding was also on fire. All of my years of being a fire investigator did not go to waste this looked like an arson fire. Units from the Durango Fire & Rescue Authority arrived shortly after I did and I was contacted by Battalion Chief Tony Harwig, who was assigned to establish the tanker shuttle group. Chief Jim Piccoli from the Upper Pine Fire District had arrived with his units and he was put in service as the scene safety officer. All units operating at the scene were switched to a common tactical frequency. Additional lines were stretched to extinguish the peripheral fires and to assist with the knock down of the fire in the main structure. The fire ground was also split into east and west divisions to help facilitate accountability and communications. Deputy Chief Rod Richardson from Upper Pine Fire had joined me at the command post and I requested that he check to assure that accountability tags had been collected from all of the personnel operating on the fireground. A number of out-of-place items were noted by the personnel operating at the scene. These items included two rifles sitting against stone pillars that flanked the sides of the driveway, a small liquid petroleum gas (LPG) fired camp stove that was burning on a flatbed trailer in the area of the horse trailer, and an open bottle of wine with a half-filled glass and a vase filled with weeds sitting on a decorative stone wall in the front yard. I had requested that a sheriff s deputy meet me at the command post. The observations were pointed out to the deputy, and I requested investigative assistance from the sheriff s detectives for the origin and cause of the fires. As daylight was approaching, these indicators, along with other information that was coming in was starting to lead me to believe that the vehicles that had arrived on the scene had been shot at, not hit with shrapnel and ammunition going off in the fire. Shortly after this, a law enforcement officer who had been checking the perimeter of the scene signaled for other officers, who went to his assistance with weapons drawn. I gave a heads-up over the tactical channel due to the law enforcement activity, which was shortly followed by the safety officer advising everyone to get down. I had a face-to-face discussion with Piccoli, expressing my desire to pull all of our personnel off the fireground due to the potential of an active shooter still on scene. At about this time, the law enforcement officers were calling for medics. The officers had found a subject with what was believed to be a self-inflicted gunshot wound to the face. The subject was transported to the hospital by Upper Pine Fire s medic unit. 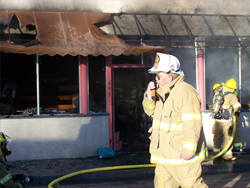 Once the scene was secured by law enforcement, normal fire suppression operations resumed. As time progressed, mutual aid units were released and a long afternoon was spent overhauling the scene. Additional investigative assistance had also been requested from the Durango Fire Marshal s Office. The LaPlata County Sheriff s Office, in conjunction with the other law enforcement agencies on the scene, were conducting the investigation into the shooting. Put yourself in the decision-making mode with the information that was available at the time. At the end, we will discuss what we can do better at the next incident to keep our firefighters and the public safe. This is not a critique of all the agencies on the scene that day. Our intent is to make the next scene safer for all responders. Law enforcement agencies Southern Ute Tribal Police (SUPD) is dispatched by SUPD Dispatch in Ignacio; LaPlata County Sheriff s Office is dispatched by LaPlata County Central Dispatch in Durango; Ignacio Police Department is dispatched by SUPD Dispatch in Ignacio (same frequency as tribal police); and Colorado State Police (CSP) is dispatched by CSP Dispatch in Montrose. Ammunition exploding could mean gunfire until proven otherwise. Things do explode in well-developed structure fires. This incident should heighten your awareness. Ammunition will ignite when exposed to flame and high temperatures (above 250 degrees Fahrenheit). Be cautious of low-energy fragments. A law enforcement representative with decision-making authority is needed at the command post. The incident command system still works. A unified command with law enforcement may have given us information earlier at this incident. Don t assume you will be OK at an incident because you have always been OK after other incidents. Complacency is one of the most serious causes of accidents on the fireground. The attitude that, this is just another routine call, just like all of the other calls that I have returned safely from, is an attitude that kills firefighters. Every call must be treated as the most dangerous call of your career. Evacuation of all the personnel operating at an incident for reasons such as potential building collapse, lack of fire flow, worsening conditions, etc., is OK. These reasons should also include unknown situations! That decision should be based on information, your comfort with conditions, prior experiences in area, or law enforcement request. The decision to stage or not to stage rests with the company officer or person in charge of the first arriving unit. Notify dispatch and other responding units of your intention and location. Consider the hazard at hand and stage far enough away to avoid becoming part of the incident! If the fire station is within a half mile of the incident, it may be the best place to stage. Just be ready to respond. Keep in mind that crowds may be an additional hazard. The best plan may be to retreat to insure the safety of your personnel. If you and your crew are in eminent danger, call for law enforcement assistance immediately! Make sure dispatch understands the urgency of the situation. Your department issued you a helmet for a good reason. Wear it! In some incidents it may be necessary for law enforcement to deliver the patient to you at the staging area. Along with the lessons learned, we want to provide some reminders and food for thought when firefighters respond to incidents that have a potential for violence. What is a violent incident? Any response to shootings, stabbings, cuttings, assaults or any other type of incident in which fire personnel may be exposed to harm as a result of a violent act.Speculation into the Speculation into the shooter s motive continues, and reports have been written and filed by the various agencies involved in this incident. It took a few days to sink in, but I had received one of the greatest Christmas gifts of all time: everyone who responded to this incident had returned to quarters. Tom Aurnhammer is deputy chief of the Los Pinos Fire Protection District in Ignacio, CO, in charge of operations and training.